Frosting:1/2 c. butter1 c. packed brown sugar1/4 c. milk or cream2 c. confectioners sugar1 tsp. 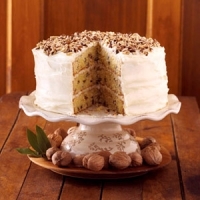 vanilla Cake: Cream together sugar and butter for cake. Add eggs. Beat on medium speed of mixer for 2 minutes. Mix dry ingredients together lightly with fork. Add dry ingredients alternately with milk. Stir in vanilla and nuts. Pour into greased and floured 13 x 9-inch pan. Bake at 325° for 45 to 50 minutes. Frosting: Melt butter in saucepan. Add brown sugar. Boil 2 minutes. Add milk; bring to boil. Remove from heat. Cool to lukewarm. Beat in sugar and vanilla. Frost cake. Sprinkle chopped nuts on top. 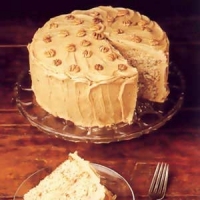 Recipe categories: Desserts, Cakes, Breads.